As you probably know, Star Trek was cancelled in 1969 after three seasons on NBC. The series’ ratings had been low in primetime but, in 1970s syndication, Trek became a runaway hit. This inspired a renewed interest in science fiction and local TV stations started looking for new sci-fi programming. Enter Space: 1999. Space: 1999 is a British series that began running in the U.S. on October 17, 1975. The series premise was set up in the first episode, entitled “Breakaway.” In the distant year of 1999, Earth has a space station on the moon called Moonbase Alpha. The locale is used for scientific research and to watch over a huge nuclear waste dump on the farside of the moon. When a massive thermonuclear explosion in the dump occurs, the moon is ripped from its orbit and sent hurtling through space. With Earth in the midst of devastation, the space station’s 311 stranded crewmembers must resign themselves to search for a new home on some distant world. The series was produced by Sylvia and Gerry Anderson, well known for other science fiction series like Thunderbirds and Fireball XL5. 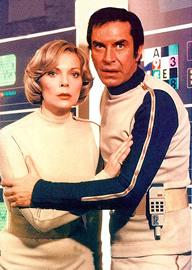 Space: 1999 stars Mission: Impossible veterans (and, at the time, married couple) Martin Landau as Moonbase Commander John Koenig and Barbara Bain as the head of the base’s Medical Section, Doctor Helena Russell. The Fugitive’s Barry Morse plays science adviser Professor Victor Bergman. Others in the diverse cast include Zienia Merton, Anton Phillips, Suzanne Roquette, Jeffery Kissoon, and Nick Tate. The tone and production values of the series’ first season were heavily influenced by Stanley Kubrick’s 2001: A Space Odyssey movie. The Andersons separated after the first season and Fred Freiberger was brought in when Sylvia left the show. Freiberger had produced the third season of Star Trek and went on to work on The Six Million Dollar Man. As a result of the backstage changes, the second season of Space: 1999 moved towards a more traditional action format. Morse left the series in a salary dispute and most of the supporting castmembers were dumped. No on-screen explanation was offered as a reason for the missing characters. A mention that Morse’s character was the victim of a malfunctioning space suit was ultimately cut from season two’s opening episode but remained in the novelization. Catherine Schell joined the cast as a shape-shifting alien named Maya and Tony Anholt played the new head of security, Tony Verdeschi. Year one was very popular worldwide but season two wasn’t nearly as successful. Many castmembers had expressed their unhappiness with the later scripts and Anholt had reportedly decided to leave after the second year. There were some plans for a third year but a decline in syndication sales killed it. As a result, the series wasn’t given any kind of ending. Over 20 years later, a seven minute film was created called Message From Moonbase Alpha. The short was filmed for the Space: 1999 Breakaway Convention in Los Angeles that was held on September 13, 1999 (the date of the show’s moon explosion). The short was created for the one-time convention showing but was subsequently included on the DVD series megaset release. Message was written by series writer Johnny Byrne. It features Zienia Merton in her series role as Sandra Benes delivering a final message from the moon residents. The “transmission” only briefly mentions some of the characters, but it does offer a bit of long-needed closure for fans who wondered whatever became of Moonbase Alpha and its staff. Stay tuned! The season one opening. Space:1999’s season two opening. A final message from the crew of Moonbase Alpha. Space: 1999: NASA Has Nuclear Plans for Lunar Station — Sound Familiar? I think you need to bring it back As space 1999 next generation since the offspring would be running the base. And offer explanation for improvements of the base since there are no re-supplies. Very cool. I hade not seen this clip before.